Thiamine availability is involved in glycolytic flux and fermentation efficiency. A deficiency of this vitamin may be responsible for sluggish fermentations in wine making. Therefore, both thiamine uptake and de novo synthesis could have key roles in fermentation processes. Thiamine biosynthesis is regulated in response to thiamine availability and is coordinated by the thiamine sensor Thi3p, which activates Pdc2p and Thi2p. We used a genetic approach to identify quantitative trait loci (QTLs) in wine yeast and we discovered that a set of thiamine genes displayed expression-QTL on a common locus, which contains the thiamine regulator THI3. We deciphered here the source of these regulatory variations of the THI and PDC genes. We showed that alteration of THI3 results in reduced expression of the genes involved in thiamine biosynthesis (THI11/12/13 and THI74) and increased expression of the pyruvate decarboxylase gene PDC1. Functional analysis of the allelic effect of THI3 confirmed the control of the THI and PDC1 genes. We observed, however, only a small effect of the THI3 on fermentation kinetics. We demonstrated that the expression levels of several THI genes are correlated with fermentation rate, suggesting that decarboxylation activity could drive gene expression through a modulation of thiamine content. Our data also reveals a new role of Thi3p in the regulation of the main pyruvate decarboxylase gene, PDC1. This highlights a switch from PDC1 to PDC5 gene expression during thiamine deficiency, which may improve the thiamine affinity or conservation during the enzymatic reaction. In addition, we observed that the lab allele of THI3 and of the thiamin transporter THI7 have diverged from the original alleles, consistent with an adaptation of lab strains to rich media containing an excess of thiamine. The online version of this article (doi: 10.1186/1471-2164-15-1085) contains supplementary material, which is available to authorized users. Controlling the alcoholic fermentation rate of Saccharomyces cerevisiae is a key issue for various industrial processes such as wine making, brewing and industrial alcohol production. The glycolytic-fermentation pathway is an essential metabolic process that is linked to the availability of enzyme cofactors, such as NADH/NADPH  or vitamins, especially thiamine pyrophosphate (TPP). This vitamin is involved in pyruvate decarboxylation to acetaldehyde. Glycolytic flux can occur at various intensities depending on strains  and environmental conditions. In the wine making process, thiamine levels play a critical role in the outcome of fermentation and a lack of thiamine causes sluggish or stuck fermentation [3, 4]. Grape musts can contain different amounts of thiamine (from 150 to 750 μg/L) depending on grape varieties, agricultural practices and grape processing methods . As a result, the addition of thiamine to musts is a common practice in many cellars. Yeasts actively incorporate this vitamin at the beginning of wine fermentation and no thiamine is left in the medium after six hours . However, S. cerevisiae is also able to synthesize thiamine de novo from hydroxy-ethylthiazole (HET) and hydroxy-methylpyrimidine (HMP). Nine genes are directly involved in thiamine synthesis: THI4 (encodes the HET synthase from D-ribulose 5-phosphate (RP), cysteine and glycine), THI5/11/12/13 (encode HMP synthase from pyridoxal 5-phosphate (PLP) and histidine), THI20/21 (HMP kinase), THI6 (HET kinase facilitates the fusion of HMP-HET to thiamine) and THI80 (thiamine pyrophosphokinase). The expression of these genes requires a high degree of coordination and regulation so that cells can adapt according to thiamine availability. Cellular content of thiamine is sensed by the association of three proteins: Thi2p, Thi3p and Pdc2p, which controls the expression of genes in the thiamine biosynthetic pathway . When the intracellular thiamine level is low, the free form of Thi3p associates with Thi2p and Pdc2p, and the resulting complex activates the transcription by binding to the THI gene promoters [6, 7]. Pdc2p is also known to independently activate the expression of the two pyruvate decarboxylase PDC1 and PDC5. While PDC1 expression is reportedly not controlled by thiamine level, PDC5 expression is activated during thiamine deficiency by an unknown mechanism . Activation of THI genes expression has been reported at the end of the growth phase in fermentation, where a decrease in thiamine concentration allows an activation of the pathway. The THI genes were shown to be highly expressed throughout the stationary phase until the end of the process. This is in accordance with a high requirement for thiamine in yeast metabolism . Additionally, enzymatic catalysis has been shown to slowly dismantle the thiamine cofactor as demonstrated with the Escherichia coli acetohydroxyacid synthase and Zymomonas mobilis pyruvate decarboxylase . There is considerable variation in the ability of yeast to ferment wine as illustrated by the phenotyping of 72 S. cerevisiae strains . Some of these differences may arise from modifications in glycolytic enzymes/flux and the availability of cofactors such as thiamine. Variations in the expression of genes involved in thiamine metabolism were observed between the lab strain S288c and the wine strains derivative 59A, which is a sequenced haploid descendent of the strain EC1118. Strain 59A demonstrated stronger expression of THI genes and PDC5, but weaker expression of PDC1 than the lab strain (unpublished data). Uncovering the genetic variations responsible for the different levels of gene expression would enhance our understanding of the evolutionary mechanisms involved. In yeast, quantitative trait locus (QTL) analyses are now widely used to highlight the allelic effects on phenotypes [12, 13, 14]. Variation in regulatory networks have been studied by using both transcriptomic analyses and genetic approaches . 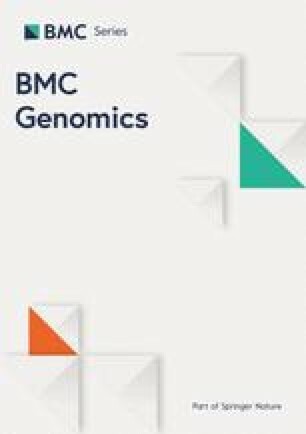 We previously carried out a linkage analysis of yeast genes expression under wine alcoholic fermentation conditions [16, 17]. This analysis combined transcriptomic data and phenotype measurements (fermentation rate and metabolite release) of a segregating population from the wine derivative strain (59A) and strain S288c. We searched for expression QTLs (eQTLs) and identified 1465 eQTLs linkages (601 cis-eQTLs and 864 trans-eQTLs) . In this work, a small eQTL hotspot on chromosome 4 was associated with thiamine metabolism without further analysis. Here, we explore variation in this regulatory network. Seven genes involved in thiamine metabolism have a linkage in the hotspot, which maps to the position of THI3. Surprisingly, the expression of the major pyruvate decarboxylase encoding gene, PDC1, is also impacted by this locus. However, variations in the expression of other THI genes were found to be controlled by other factors. We also suspect that variation in expression of the thiamine transporter, THI7, is linked to a mutation in its promoter. For the other THI genes, we observed a strong correlation between expression and fermentation rate. Our previous study concerning the genetic analysis of expression variations during wine fermentation, in synthetic must  revealed a hotspot of 11 eQTLs that mapped to the position 310 kbp on chromosome 4. The genes displaying an eQTL at this locus are listed in Table 1 and the distribution of their expression in the population of segregants is shown in Figure 1A. Several of these genes are involved in thiamine metabolism including thiamine biosynthesis (THI5/11/12/13) and thiamine mitochondrial transport (THI74), or regulated by thiamine level and have a putative role in thiamine metabolism (PET18) . The gene TPN1, which also displays an eQTL at this region, encodes a plasma membrane transporter of pyridoxine, a thiamine precursor . In addition, two other genes are controlled by this locus: the aryl-alcohol dehydrogenase, AAD14, and the major pyruvate decarboxylase, PDC1. The four homologous genes THI5, THI11, THI12 and THI13 are involved in the synthesis of the thiamine precursor hydroxy-methylpyrimidine (HMP). THI5 is absent in the wine derivative strain 59A and was not considered here. The other three genes are identical and could not be dissociated in array transcriptomic analysis given their cross-hybridization, thus they must be considered as a single response. Hotspot of eQTL mapping on THI3 . (A) Module of 12 genes that display an eQTL on this locus, underlined genes are localized in the locus (cis-eQTL). The genes are sorted by a hierarchical clustering and their expression level has been normalized. 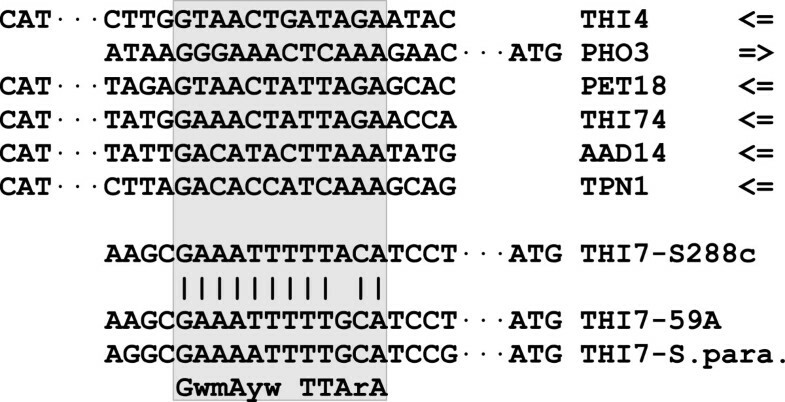 (B) LODscore pick for THI11 transcript and THI3 allele effect on its expression. (C) LODscore pick for PDC1 transcript and THI3 allele effect on its expression. Grey lines indicate the significant threshold. Expression level corresponds to array log2(I). The QTL region contains THI3 encoding the thiamine sensor which activates the expression of genes involved in thiamine biosynthesis during thiamine deficiency. The synthetic must provided an excess of thiamine, allowing for cell growth, but it was previously shown that the genes for thiamin synthesis are expressed during the stationary phase of the fermentation . Examination of 59A THI3 sequence compared to S288c revealed several single nucleotide polymorphisms (SNPs), of which three are non synonymous (Y14C, L344I and D592N). We also observed an insertion of one adenosine in a polyA chain in the C terminal region, causing a frame-shift that altered the protein from amino-acid 605 to the stop codon (Additional file 1). The S288c Thi3p sequence is 609 amino-acids long whereas the 59A version contains 621 amino-acids. We compared the THI3 sequences of the published genomes from the Sanger Institute  or in Genbank. Most S. cerevisae strains possess the THI3 allele found in strain 59A, whereas strain S288c and other lab strains (W303 and BY4742) possess the 609 amino-acids version. S. paradoxus THI3 sequence display the same number of adenine as 59A and most of S. cerevisae strain, suggesting that this version corresponds to the ancestral form of the gene (Additional file 1). The frame-shift at amino-acid 605 in strain S288c may be the cause of the reduced Thi3p function. These mutations are located outside of a proposed thiamine fixation domain (376 to 571 ), however they are in a region that might encompass an interacting domain with one of the two transcription factors Thi2p or Pdc2p. The alteration of Thi3p in strain S288c may therefore explain the change in THI gene expression and the generation of the eQTLs hotspot found in our data. The detection of the THI11 eQTL and the impact of the THI3 allele on its expression are displayed on Figure 1B. This illustrates the positive effect of the 59A allele of THI3 on the expression of the genes involved in thiamine biosynthesis. 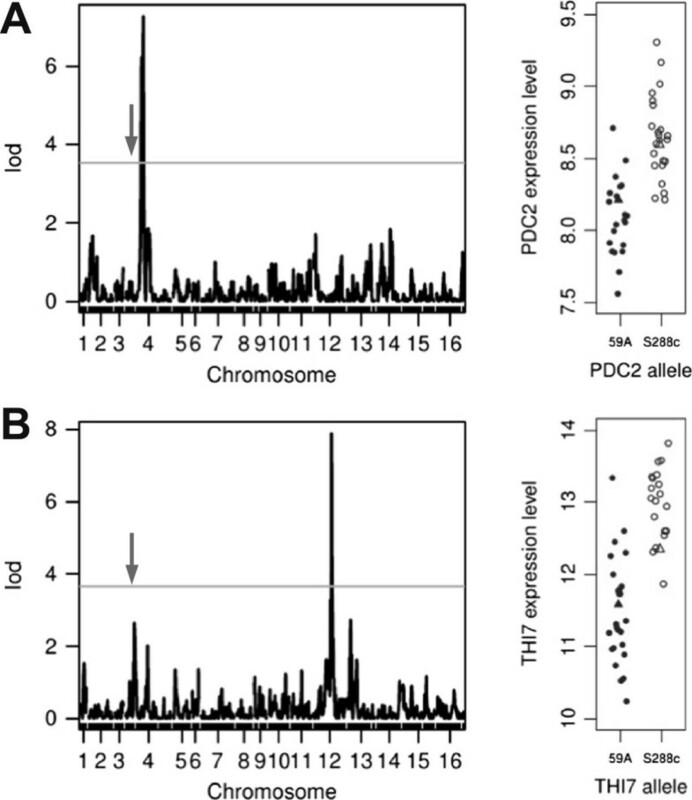 In contrast, PDC1 displays an inverse relationship with the THI3 allele (Figure 1C), its expression being higher in S288c, indicating that the alteration of THI3 in this strain has a positive impact on PDC1 transcription. The high LOD score of the PDC1 eQTL (LODscore = 6.12) suggests that THI3 allelic variation has an important role in the change of PDC1 expression. 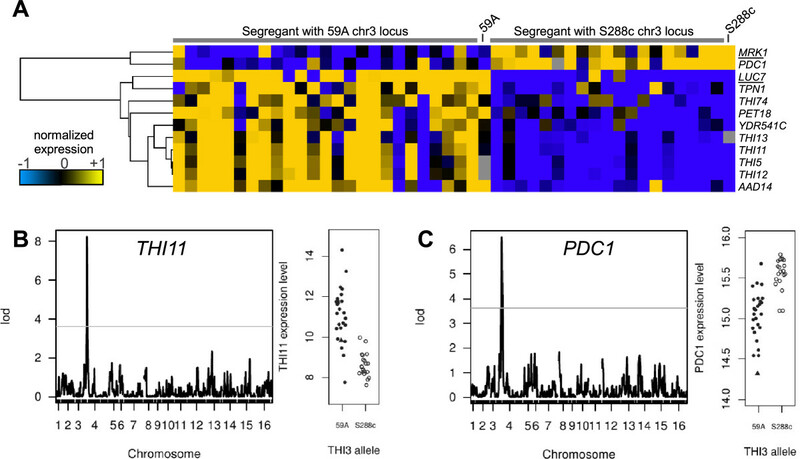 While the THI3 allele in S288c reduces THI11 expression, it enhances that of PDC1. Our data support the notion that THI3 negatively impacts PDC1 expression and the form of Thi3p in S288c is less functional. However, as only some of the THI genes are controlled by THI3 allele, we investigated whether the other thiamine biosynthetic genes displayed linkage to other loci. We did not find any instances of linkage, but instead observed that the expression of most of the genes was correlated with the fermentation rate (at 70% of fermentation progress (R70)). In our previous analysis , among the 347 transcripts positively correlated to R70, four were involved in thiamine metabolism (THI4, THI21, THI6 and THI80). We found that the secondary pyruvate decarboxylase gene, PDC5, was also one of the genes whose expression strongly correlated with R70 (Spearman’s correlation coefficient: 0.78, Figure 2A). Interestingly, this enzyme is highly expressed when there is a deficiency of thiamine . Therefore, a tight control of this set of genes by fermentation rate/glycolytic flux may have masked putative linkages to the THI3 gene. Overview of correlation between of the genes involved in thiamine biosynthesis and utilization. (A) Example of correlated expression level: PDC1 vs THI11 (negative correlation), AAD14 vs THI11 and PDC1 vs R70. Expression level corresponds to array log2(I). Parental strains are indicated with triangles. (B) Principal component analysis using as variables the fermentation rate (R70) and expression levels of several genes involved in thiamine biosynthesis and utilization. The first diagonal corresponds to fermentation rate parameters. The second diagonal corresponds to THI3 origin. We performed a principal component analysis of the population of segregants in order to observe the relationship between expression levels of the genes involved. We used the expression of selected THI genes, of the pyruvate decaboxylase genes (PDC1, PDC5 and PDC2) and of other genes involved (AAD14, PET18 and TPN1), as well as the R70 as variables. The results, displayed in Figure 2B, confirmed that the expression levels are affected by two main factors: fermentation rate and the allelic origin of the THI3. Examination of the eQTLs involving other PDC or THI genes revealed two local cis-regulations as illustrated in Figure 3. The transcription factor PDC2 displays a cis-eQTL (LOD score of 6.9) but no other gene controlled by PDC2 displays an eQTL mapping over PDC2, meaning that variation in PDC2 expression level has no major impact on its targets. The PDC2 allele from S288c is more highly expressed than that of the 59A one; it displays three non-synonymous SNPs in its coding sequence but no SNP in its promoter region, which is consistent with self regulation of its expression. LODscore pick corresponding to local eQTL; for PDC2 (A) and THI7 (B) and their allelic effects on expression (right). Expression level corresponds to array log2(I). The arrows indicate the position of THI3. The expression of the thiamine membrane transporter THI7 (alias THI10) also displays a cis-eQTL (LOD score of 7.6). Expression of the lab allele of THI7 is higher that in the wine yeast. We consistently observed six non-synonymous SNPs in the 59A gene coding sequence and four SNPs in the promoter region. A second LOD peak corresponding to the position of THI3 (Figure 3B) and the principal component analysis indicate that the THI3 allele may also have some influence on THI7 expression. There is indeed an additive effect of the allelic versions of THI7 and THI3 origin (Figure 4). THI3 and THI7 double allelic effect on THI7 expression. Expression level corresponds to array log2(I). Parental strains are indicated with triangles. To confirm the role of THI3 variation in the control of expression variation of PDC1 and THI11/12/13, an allelic switch of THI3 was performed in the 59A background, leading to the introduction of the THI3 gene from S288C (59A THI3-S288c, see Materials and Methods). We also carried out the deletion of THI3 in 59A strain, resulting in a 59A thi3Δ strain, which is auxotrophic for thiamine. To assess the impact on expression, we performed fermentation using the three strains (59A, 59A THI3-S288c and 59A thi3Δ) in a synthetic must (SM) medium at 24°C, as previously used for the QTL analysis. The transcription levels at 70% of the fermentation progress were measured by qPCR analysis for three involved genes: THI11, PDC1 and PDC5 (see Materials and Methods). The qPCR results are shown in Figure 5. The S288c version of THI3 (strain 59A THI3-S288c) was associated with an approximately 2.5 log reduction in THI11 expression. This is consistent with the S288c form of Thi3p having a lower efficiency in THI genes activation. This result confirms that THI3 is responsible for the linkage of THI genes observed in the eQTL analysis. The S288c allele of THI3 also triggered an increase in PDC1 expression of about 2 log (also in agreement with our previous eQTL data), suggesting a direct effect of Thi3p on its expression. In contrast, PDC5 expression was only slightly impacted by the allelic switch. Expression of the three genes THI11 , PDC1 and PDC5 , measured by rtPCR; depending on THI3 background in 59A strain (59A allele, S288c allele and deleted) and on condition (24°C and 20°C). Expression levels are in log2 scale (see Materials and Methods). The deletion of THI3 (strain 59A thi3Δ) amplified the effects observed for both THI11 and PDC1: a strong decrease in THI11 expression and an increase in PDC1 expression. The lower expression of THI11 confirms that Thi3p is needed for its expression. Conversely, the higher level of PDC1 expression triggered by THI3 deletion supports the idea that Thi3p has a negative impact on its expression. The expression of PDC5 was also greatly increased by the deletion of THI3. In case of thiamine deficiency, PDC5 is expressed at a higher level but the mechanism, not associated with Thi3p, is still unknown [9, 23]. Without THI3, 59A is unable to synthesize thiamine de novo and to grow without exogenous thiamine. 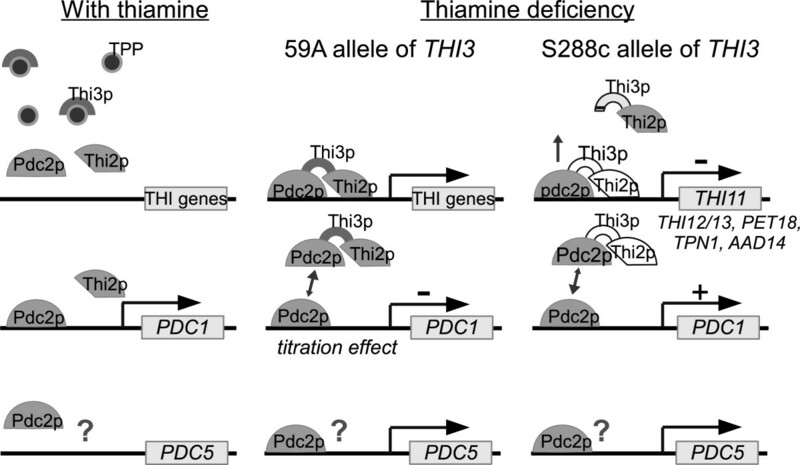 The increase of PDC5 expression in strain 59A thi3Δ is probably an indirect consequence associated with a greater thiamine deficiency. In comparison to the deletion effects, the impacts observed for the allelic switch were consistent with our suggestion that S288c allele of THI3 is less functional. We carried out a second series of fermentations at 20°C and examined the impact on gene expression. Reducing the temperature allowed us to artificially decrease the rate of fermentation and the glycolytic flux. The expression levels of PDC5 and THI11 were lower at 20°C than at 24°C (by 1.5 log and 2 log, respectively) but PDC1 expression remained constant. These results are probably due to the lower fermentation rate at 20°C and are consistent with the correlation found between R70 and PDC5 and THI gene expressions levels. This suggests that when there is a weaker glycolytic flux, the demand for thiamine is lower and therefore, we can expect reduced expression of THI genes and of PDC5. The same effect of the THI3 allele on gene expressions was observed in the 20°C fermentation. Therefore our functional analysis was validated in four independent experiments, by testing two genes in two conditions. We observed only a very small impact of the THI3 allelic switch or deletion over fermentation kinetics. 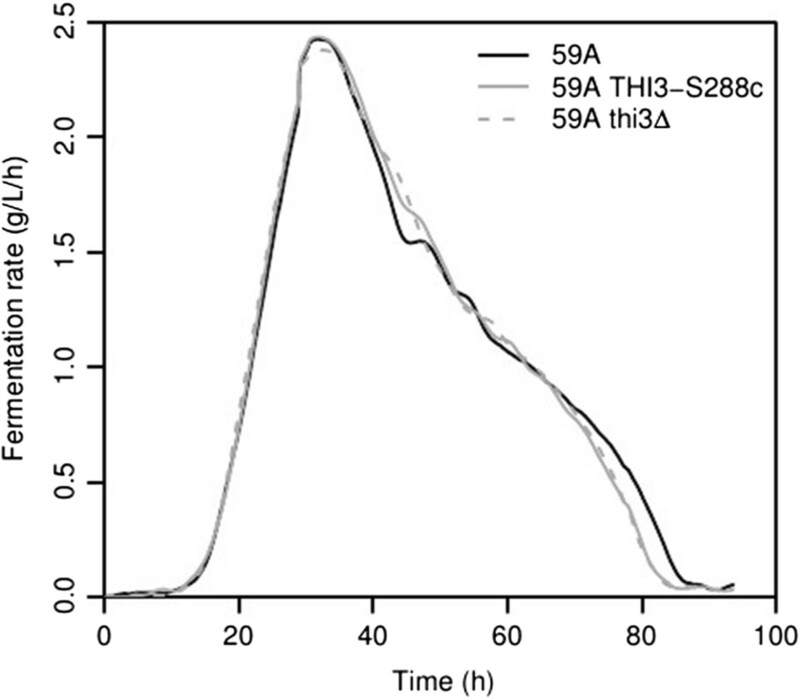 In a medium containing thiamine (250 μg/L of thiamine) at 24°C or 20°C, both strain 59A thi3Δ and strain 59A THI3-S288c fermented approximately five hours faster than the wild type strain (Figure 6). In a thiamine depleted media, the fermentation remained very slow (CO2 production rate 0.25 g/L/h for 0 μg/L of thiamine and 0.5 g/L/h for 25 μg/L of thiamine) and the maximum cell population was lower (50–60.109 cells/L) than when thiamine is available (130.109 cells/L) for the strains 59A and 59A THI3-S288c. Although S. cerevisiae is able to synthesize thiamine de novo, the capacity for endogenous synthesis is insufficient to support growth and fermentation at an equivalent level. The allele origin of THI3 has no impact on the fermentation rate (data not shown). We also analyzed the growth properties of the two strains (59A and 59A THI3-S288c) under aerobic conditions in synthetic must medium without thiamine and found no differences in growth rates or total cell population (data not shown). This indicates that growth capacity and fermentation rate in a thiamine depleted medium is not dependent to the strain ability to activate THI genes. Comparison of fermentation kinetics of 59A, 59A THI3 -S288c and 59A thi3Δ; in the synthetic must standard condition (24°C). Two additional replicates displayed the same results. A genetic approach allowed us to detect variations in THI gene expression and to link them to mutations in the THI3 gene. We propose a model of THI3 allelic effect on the transcriptional regulation of THI genes by thiamine in Figure 7 (based on the model proposed in ). In the lab strains, the THI3 version has a lower efficiency, reducing activation of THI genes. This modification is probably due to the fact that these strains were usually cultivated in rich laboratory media containing an excess of thiamine and are under relaxed selection. Again, the lab strains are not representative of global S. cerevisiae behavior, as suggested by Kvitek et al.. The laboratory allele of THI3 is not completely defective, as it does not lead to a thiamine auxotrophy. A similar observation has been made for the reduced function of ABZ1 in lab strains; this gene is involved in para-amino benzoate biosynthesis, which is unnecessary in rich media . Putative model of regulation of THI and pyruvate decarboxylase genes; under thiamine deficiency depending on THI3 allele. The regulation mechanism of PDC5 is still unknown. The eQTL analysis in wine fermentation conditions allowed us to highlight three other genes controlled by THI3: YDR541c (a putative dihydrokaempferol 4-reductase), AAD14 (an aryl-alcohol dehydrogenase) and TNP1 (a pyridoxine transporter). The uptake of pyridoxine may be important for thiamine biosynthesis, as the synthesis of HMP requires pyridoxal 5′-phosphate (PLP). Harbinson et al. identified a Thi2p binding domain by genome-wide chromatin immuno-precipitation and we observed this sequence in the promoter region of both TNP1 and AAD14 (Figure 8). These observations, and the impact of the THI3 allele on their expression, suggest a direct role of Thi3p in transcription activation of these genes. Aryl-alcohol dehydrogenases are thought to be involved in alcohol synthesis and act downstream of decarboxylating enzymes. Its control by THI3 is consistent with the theory that the two sequential reaction steps are coordinated. Thi2p binding site before several THI gene. The consensus sequence was proposed by Harbinson et al.. 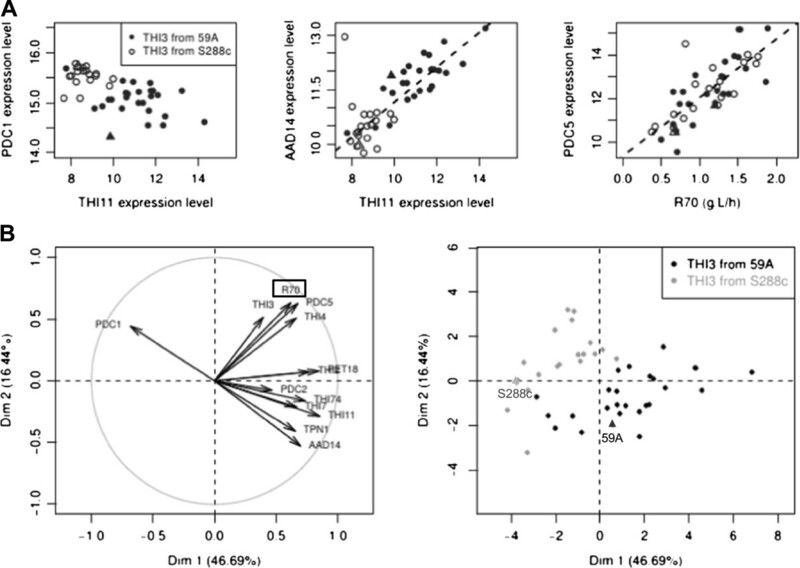 Moreover, we observed a negative impact of the ancestral THI3 allele on PDC1 expression. Other studies have exclusively used lab strains carrying the weak allele of THI3[22, 23]. This may explain why PDC1 expression has not previously been associated with Thi3p. However, Muller et al. , working with strain M5 using two-dimensional gel electrophoresis, reported a diminution of Pdc1p abundance when thiamine was absent from the medium. This response is consistent with the regulatory role of Thi3p described in our study. The thiamine transporter THI7 was found to display a local eQTL. This could be due, once again, to an adaptation of S. cerevisiae to lab conditions. We studied the promoter sequence of THI7 and observed an apparition of a Thi2p-binding domain in the sequence of strain S288c due to a SNP not present in the 59A or S. paradoxus sequences (Figure 8). This mutation is likely to have a positive effect on THI7 expression. However, this hypothesis needs to be validated by functional studies and confirm if these variations are due to positive adaptation or to relaxation. The variability of promoter sequences of the genes involved in thiamine biosynthesis has already been associated with expression variation ; which could provide for flexibility across strains to cope with a thiamine deficiency. We suggest that Thi3p does not act on PDC1 as a true repressor. When there is a deficiency of thiamine, Thi3p binds Thi2p to Pdc2p, triggering THI gene expression. Nosaka et al. have studied Pdc2p structure  and propose that the interaction with Thi3p triggers a modification in Pdc2p configuration, which activates its transactivation function and the recruitment of the THI promoter. As Pdc2p also triggers the expression of PDC1, we suggest that the formation of the Pdc2p-Thi3p-Thi2p complex reduces PDC1 expression through a titration effect. This hypothetical notion is supported by the fact that THI3 deletion in strain 59A leads to higher PDC1 expression than observed in strains 59A or 59A THI3-S288c. A lack of complex formation is likely to increase the free form of Pdc2p, which induces PDC1 expression. In contrast, PDC5 is expressed more strongly under thiamine deficiency  by an unknown mechanism that is independent from Thi3p-Thi2p control . During thiamine deficiency, PDC5 is expressed strongly but the expression of PDC1 is likely to be suppressed by the interaction of Pdc2p with Thi2-Thi3p. The reason for this putative enzyme switch remains unclear. Hohmann and Meacock  suggest that Pdc5p might have a higher affinity for thiamine than Pdc1p which may help the cell to better cope with thiamine deficiencies. McCourt et al. reported that thiamine was slowly degraded during catalysis reactions by both a bacterial pyruvate decarboxylase and a acetohydroxyacid synthase enzyme. The Pdc1p to Pdc5p shift could allow us to suspect that Pdc5p is better at conserving thiamine whereas Pdc1p optimizes the rate of decarboxylation flux. These hypotheses need to be confirmed by further experiments including the protein-protein interaction measurement for Thi3p as well as the transcription factor and substrate affinity determination for the two pyruvate decarboxylases. 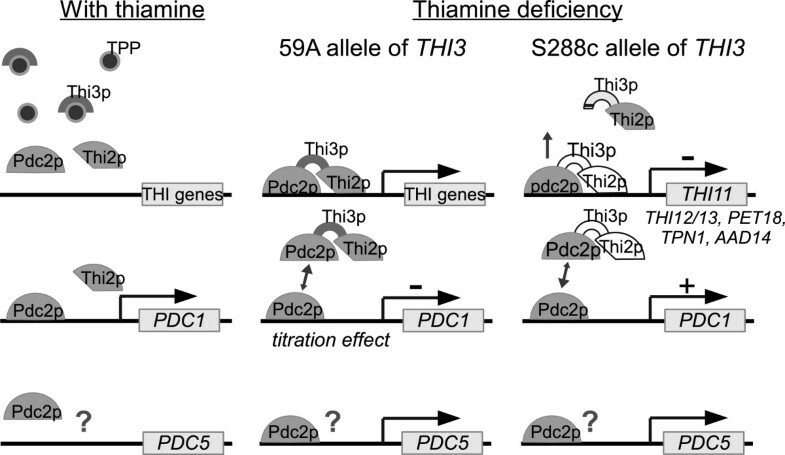 The reduced ability of Thi3p to sense thiamine deficiency in lab strains leads to greater PDC1 expression; this may have been an adaptive advantage in rich media containing high thiamine concentrations. Under such conditions, de novo synthesis of thiamine by THI genes is not critical but the rate of decarboxylation could be optimized. This is relevant to the small improvement of fermentation rate in the strain carrying the lab allele of THI3 in the thiamine-rich medium. Overall, our data indicate that the thiamine gene network regulation was significantly impacted by the adaptation of Saccharomyces cerevisiae to thiamine rich laboratory media which masked some regulatory mechanisms and target genes in this species. Therefore, we proposed a putative model of regulation for the main pyruvate decarboxylase in this species, which is dependent on thiamin availability. Our results also suggest that, in conditions of high decarboxylating activity, the impact of catalysis on the thiamine cellular content likely plays a role in the THI genes expression levels. The two parental strains used in the global analysis are S288c (MATα; SUC2, gal2) and 59A (MATa; ho), which is a haploid derivative of EC1118 (Lalvin EC-1118, Lallemand, HO/ho), an industrial wine strain . Mutations between the two parental strains are accessible in the GenYeasTrait database previously described (http://genome.jouy.inra.fr/genyeastrait/). The fermentations were performed for the global analysis, as presented in , in a synthetic SM425 medium (with 425 mg/L of assimilate nitrogen pH3.3 and previously describes as SM300 ) which mimics natural grape must. Except when indicated, this synthetic medium contained 250 μg/L of thiamine (Sigma T-4625). The same medium and method was used to analyze the constructed strain (59A, 59A THI3-S288c and 59A thi3Δ). For the fermentation and growth of 59A and 59A THI3-S288c on SM425 without thiamine, the preculture was performed in shake flasks containing 30 mL of SM425 without thiamine at 28°C. THI3 allelic switch in 59A was obtained in two steps: 1) a deletion of THI3 in 59A using loxP-kanMX-loxP (pUG6 ) and 2) an allelic switch by replacement of the kanMX cassette by THI3 sequence form S288c DNA. Primer sequences for cassette amplification and verification were obtained from Euroscarf. The transformants were selected on YEPD supplemented by G418 (200 μg/L). Primers for the allelic switch are displayed in Table 2. Reinserted THI3 clones were selected on synthetic minimum medium without thiamine (YwoT, see Additional file 2). The loss of the kanMX cassette was confirmed by PCR and by the absence of growth on YEPD supplemented with G418. Details on the transcriptomic profiles for the global analysis were provided in a previous publication . This profiles were obtained at 70% of the fermentation progress. The Cy3-labeled cRNAs were hybridized on Agilent gene expression microarrays 8x15k with the one-color method (Agilent Technologies, Santa Clara, CA, USA). Array design is based on ID 016322 completed with the 39 genes from the new regions of EC1118  and available on GEO under the accession number GPL16012. The array pictures were analyzed on a GenePix 4000B laser Scanner (Axon Instruments) with the GenePix PRO7 software. The complete array data set is available on the Gene Expression Omnibus database (http://www.ncbi.nlm.nih.gov/geo, global analysis: GSE41025). Data normalization and statistical analyses were performed using R 2.13.1 software and the limma package ([31, 32, 33, 34]). Normalization was done using the quantile method considering the whole array data set (55 arrays). The normalized LOG2 of the spot-median intensity was used as the quantitative evaluation of gene expression (5.3 corresponding to background signal, 16 to spot saturation). The individual genotyping method is described in a previous publication  on Affymetrix YGS98 microarrays. The marker map was designed according to a selection inspired by Brem et al. 2002 . This resulted in a map of 2140 markers that we completed with 46 markers localized in areas of low markers density . These markers were based on single nucleotide polymorphism detection using Illumina veracode technology. The linkage analysis was performed using the R/qtl package . The normal model with a Haley-Knott regression method was used resulting in logarithm of odds (LOD) score for each marker and pseudo-marker every 2.5 cM (7.5kbp, interval mapping method). An interval estimate of the location of each eQTL was obtained as the 1-LOD support interval: the region in which the LOD score is within 1 unit of the peak LOD score. To calculate the false discovery rate of 0.1 at the LOD score threshold of 4, the permutation was performed 20 times, and the average number of transcripts showing linkage was used. The fermentations were performed in synthetic must (SM) medium at a temperature of 24°C, as previously used for the QTL analysis. At 66gCO2/L release (70% of fermentation progress), 109 cells were sampled, pelleted, washed with DEPC-treated water and frozen in methanol at -80°C. Total RNA extractions were performed (as described in ) using the TRIzol® reagent (Gibco BRL, Life Technologies), then purified by isopropanol precipitation and the RNeasy kit (Qiagen). Quality and quantity of RNA were controlled at each step by spectrometry (NanoDrop 1000, Thermo Scientific). The cDNA was produced by reverse transcription with SuperScript III Reverse Transcriptase (Invitrogen 18080-093, 60 min at 50°C). A 1 in 10 dilution of the resulting cDNA was used for the real-time qPCR assays with gene-specific primers (Table 2) and Power SYBR Green PCR Master Mix (P/N: 4367659 Applied Biosystems) in an ABI7300 qPCR machine. The qPCR was performed in three technical replicates. Expression levels were calculated in LOG2 using a calibration range of gDNA for each primer pair then measured relative to UBC6 expression for each condition. A global correction of the data was performed, taking the lower replicate expression level as 0, for THI11 expression in 59A thi3Δ, as this strain is not able to express this gene. The good stability of the results was controlled by the SCR1 expression level which did not change between conditions (data not shown). Transcriptomic row data are available in Gene Expression Omnibus database (global analysis: GSE41025, PDR8 allelic switch analysis: GSE41738). Other supporting data are include in the Additional files 1 and 2. CB participated in the design of the study, performed the data acquisition and analysis, and drafted the manuscript. CA participated in the design of the study, and realized the 59AxS288c lineage. PD performed the fermentation for testing the modified strains. IS performed the statistical analyses, the transcriptomic data processing and the eQTL linkages. BB conceived and coordinated the study, and provided guidance over the manuscript preparation. All authors read and approved the final manuscript. C. Brion was supported by a grant from French Ministry for Higher Education and Research. C. Ambroset was supported by a fellowship from the INRA Département Microbiologie et Chaîne Alimentaire (MICA) and the region Languedoc-Roussillon.